I am so ready for this game. Final score 15-9; Dickerson scores 3 drop-kick FGs and Janikowski and Myers both kick 50+ yard FGs. Prosise is hurt again... #CutHim. Seahawks GM John Schneider says on pre-game radio show that C.J. Prosise has "a little hip injury'' and won't play tonight. That may also explain adding a running back earlier this week. Looks like Duane Brown, Quinton Jefferson and Branden Jackson were in the locker room during the anthem. Ran on to the field after it was over. Seahawks win the coin toss. Sign of things to come! Colts convert on a couple of plays but settle for a field goal. Robert Turbin ends up converting on a 4th and 1 on a pass from Luck earlier in the drive. 1st QTR 3-0 and time for Russell Wilson to get his first look of the 2018 year. 1st play from scrimmage and Wilson takes a play-action play for a 6-yard run. On the 3rd play, Carson gets 4 on a run up the middle with no clear lanes. 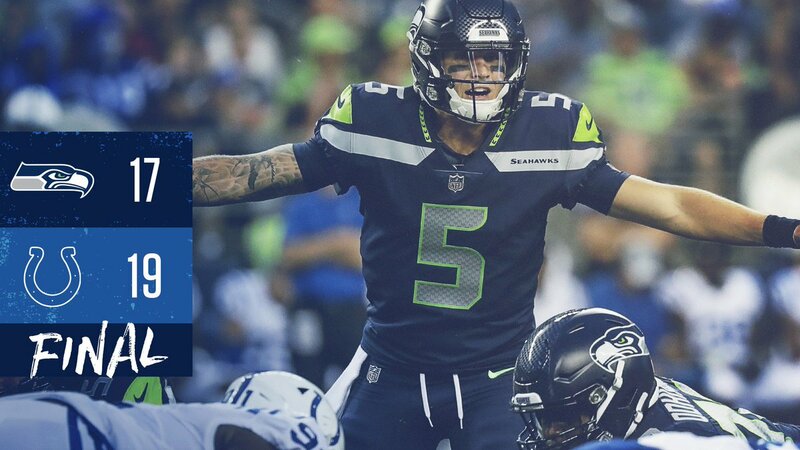 Seahawks drive 75 yards, convert on a 4th and 1 of their own, Penny with key runs (and a pass block), Carson with huge, tough yards and Vannett scores a TD. Good game! First stringers looked good. Shaquem had a team high 9(?) tackles and was flying all around. If I'm honest, I feel Dickson is our new punter. He can kick as well as Ryan but at a lower price point. Rasheem Green looked like a great pick. He'll be formidable on the line. If I'm still being honest, I mostly watched Shaquem tonight. I didn't know I was gonna fanboy on him but I did. I was watching him like he was my son or something. Ridiculous. I'll shake it off after a couple games I think. But I know I'll be super protective of him and very sternly yell at my tv if the refs pick on him or a player gets in his face or something. I formally declare that the rookie I sponsor this season is Shaquem Griffin. Dibs. I called it. Get your own rookie.